It’s nearly that time of year again for the Thomson Reuters Elite VANTAGE conference. Held on 10-11 October in Sydney, MOSMAR are again silver sponsors and promise to captivate you all at our session on MatterSphere workflows. As always, we will provide a sugar hit to keep you awake and enthralled. There is always much to learn at VANTAGE while having a great catchup with friends and colleagues in the industry. Be sure to register, and see you there! A new feature in DocAssist as of build 1094 is “Clippings”. We like to think of clippings as an easier and more versatile version of autotexts or building blocks. As you probably know, autotexts and building blocks can only be saved to templates, there’s not many options for organising them, sharing is a pain, and updating them is even more painful. So what are Clippings. Well they are really just documents that can be inserted in to another document. Not hugely exciting until you see how they can be used. First of all you need to configure the locations for the clippings. You can have up to 3 locations currently. We recommend Personal, just for you, Shared for your department or practise group, and Precedents for firm or company wide clippings. The locations can be on a network or local – whatever works best for you. If you have DocAssist build 1094 or newer, you will see the configuration settings within the Settings.xml file. Now create some clippings. In a Word document, highlight some text you want to reuse as a clipping. Then press Shift Alt S (the shortcut we usually setup – or run the SaveClipping macro) and you will get the following screen. Select a location to save to, and then select a folder. You can also right click to create your own folders, or rename existing ones. 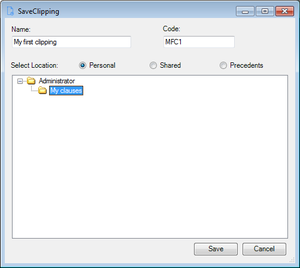 Give your clipping a name, and also an optional code, and hit save. What’s the code for…that’s the fun part. Create a new document in Word, and then type in the code and press F3 (or run the InsertClipping macro) DocAssist will find the clipping and insert it in your documents – just like an autotext/building block. And for those clippings you don’t have a code for, or you forget the code, you can browse all of the clippings that are available just by clicking on the Clippings button on the ribbon. So now you have a simple way to save your own autotexts, or share them with your department or entire company or firm. 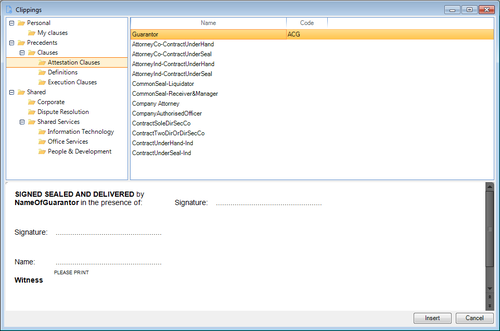 You can create a standard set of codes to have them easily and quickly inserted in to documents. Plus you can create your own taxonomy for sorting your clippings. And to top it off, you can even create shortcuts to specific folders within your clippings. So you can have options on the ribbon to say insert an execution clause, or insert an address, and it will bring up a list of all clippings from that location. This is a very simple yet powerful feature and has received great feedback so far, so make sure you give it a go. It’s all now part of DocAssist. Have you ever tried to open a .CHM file in Windows, and it shows the index but no content? Not exactly HELPful. It had me stumped when checking out the NetDocuments ndOffice extensibility documentation. Well it turns out to be such a simple fix. Right click on the .CHM file, select Properties, then select Unblock. I’ve been having an extremely strange issue with a custom application. Basically the application is a form that displays to the user so they can select some options relating to how they want to print a document in Word. The form then goes off and does a few things with the printer driver and prints the document as required. For some strange reason the form started playing up recently, and users were reporting that it was locking up sometimes, and the only way you could close it was to end the WinWord process in Task Manager which is a little drastic! With a bit of debugging (and luckily being able to replicate the issue) I found the problem code was calling the DocumentPropertiesA function from winspool.drv. This was the part of the code that was updating the printer driver with the new settings. All of a sudden the call was not returning in some instances, but in a strange twist execution was returned to the form. No exception was returned. I enabled all the controls on the form to test further, and it turns out the form was indeed active again, and the buttons would work, but you could not close the form. A bit of research reveals you cannot close a form if there is another event still running. So I guess the code running on the OK button event was considered to be still running. If I clicked on the OK button again, the same code would run, but at the same line of troublesome code would actually return an AccessViolationException error, and you could not continue the code. So a bit more research and yes, AccessViolationException is bad, and your code should stop. But here’s where it gets interesting. In versions of .Net 3.5 and earlier, an AccessViolationException would get passed back to the CLR and you could trap it. As of version 4 it does not. Well thanks for that Microsoft. You can read all about it here. That was like trying to find a needle in a haystack. And voila, the TRY CATCH around the problem line picks up the exception. I can now catch the problem. Turns out it’s not fatal in this case, and the code can keep running, and even more strangely, it works. I suspect there is still another problem that needs a little more investigation, but I’m now back to a print dialog form that appears to work the same as before which no longer locks up. So happy users, and happy developer. Ever needed to know what registry entries are required to register a COM DLL? Well I did recently. Sometimes you get caught out with Visual Studio Setup Projects (well that’s if you’re still using VS 2010 – bring back Setup Projects in VS Microsoft!) copying referenced DLLs locally and registering them by default. This often happens with WorkSite or Office addins. Well to get around the problem I needed to re-register the DLL as part of the install process for the new version. After much experimentation I decided it was easiest to simply add the registry entries for the DLL to the new installer. This is where I came across a handy util that is part of Visual Studio – regcap. With Regcap you can find out what registry values are added when you register a DLL. Interestingly I had problems running this application on Windows 7 for this particular DLL. I tried several suggestions like setting compatibility mode for regcap, running as admin etc, but nothing worked for me. To get around the issue I copied the DLL to another dev machine running Windows Server 2003, and regcap worked a treat. I then imported the reg file that was created in the installer for my app, and problem solved. Just a quick tip to save some time debugging classes. Did you know that if you make changes to a class, the changes don’t take effect until you re-instantiate the class? That’s why you don’t see your changes taking effect, or your breakpoints being hit. So, just re-run the AutoExec routine in the template you are editing (because that is usually where your class is initialised) and you should be in business. where MyClass is the name of your class. Just do a search through your code for the New keyword followed by the name of your class if you don’t know where it is. Now you can make changes to your class, rerun AutoExec (or the other macro that instantiates the class) and you can continue to debug. Saves restarting Word and having to setup all your breakpoints again. In Word 2003, if you need to know if a document contains any VBA code/macros in it, you can use the following function. To get the function to work correctly, you will need to change a security setting and enable the “Trust access to the VBA project object model” setting. Once you’ve enabled that setting you can do lots of fun stuff within VBA – but I’ll cover that in some other posts one day. Life is much easier in Word 2007 and 2010. You can just use the HasVBProject property of the document. It returns TRUE if there is code in the document, otherwise it’s FALSE. Too easy! Microsoft was even nice enough to add it to not only the Document object model, but also to the Workbook and Presentation objects, so it is also available in Excel and PowerPoint. Nice one – it’s about time there were some more consistencies between the object models in Office. I like it when my code becomes redundant for a good reason.